It’s Chainsaw Hand Time Ash! We’re back with some more of Ash and The Evil Dead. 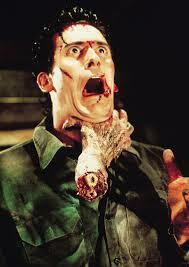 Today I’ll be talking about the 1987 sequel to The Evil Dead, The Evil Dead 2. This article is part of a series about The Evil Dead franchise because on my favorite day of the year Ash vs Evil Dead will premiere on Starz at 9 pm est. That’s Halloween, which is this Saturday, if you weren’t sure which day I hold nearest and dearest. The Evil Dead 2’s opening actually confused me a bunch the first time I watched it. We see Ash and his girlfriend Linda driving up to a cabin in the woods and then we get a quick recap of the two of them being attacked by demons. I really thought Ash had just decided to bring a new girlfriend to the cabin that murdered his friends and was wondering if he had lost his mind by bringing this new girl there. For the record he has lost his mind, but this intro scene is actually a rewrite of the original backstory. In later stuff this new backstory is sort of ignored, but it does exist. We then jump to Ash in the cabin all alone being tormented by the demons around him. We get to meet the daughter of the man who originally owned The Book of the Dead as well as her significant other, I forget if he’s a boyfriend or not, and two people who live somewhere near the cabin. The daughter is shocked to find Ash and not her father at the cabin and with more people the demons get to work exacting all sorts of evil deeds. This movie is where Ash gains his most well known feature, the chainsaw hand. I impatiently watched the first movie waiting for it to appear, but nope, chainsaw hand is part of the sequel and not the original. At the end of movie Ash finds himself sucked through time and space and winds up dumped in a sandy place with knights. 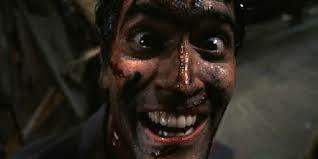 Evil Dead 2 has the same sorts of effects as the original, which I think are fabulous! We get to see a demon possessed Ash and that chainsaw hand is just a sight to behold. The movie is a bit on the campy side, but it’s definitely a must watch horror movie. I would suggest watching it right after you watch The Evil Dead because the stories mostly follow right after each other, if you pretend the random intro to Evil Dead 2 doesn’t exist. Sorry, but I just don’t understand why they rewrote the backstory for the sequel. If someone knows the reason I would love to know why. I live tweeted this movie too, though it was a while ago. You can find the tweets on my Twitter with #TheEvilDead2 in them. You can also just tweet at me, @kleffnotes, if you want to let me know your feelings about horror movies, Halloween, or Ash and his awesome chainsaw hand. You can also find me at my blog kleffnotes.wordpress.com or on Periscope, @kleffnotes, or YouTube, I’m kleffnotes there too. You can also comment below or tweet at The Nerdy Girl Express, @thenerdygirlexp. We’d love to hear from you.